Background: - Diabetic foot infections (DFIs) are mostly poly-microbial in nature and the organisms isolated are frequently mixed organisms though the spectrum of organisms depends on other factors such as microbial flora of the lower limb, metabolic factors, foot hygiene and the use of antibiotics. Methodology: - Sixty four each of with diabetic foot ulcer were included in this study. This study was conducted in Dept. of Surgery, Madhubani Medical College, Bihar. Duration of the study were six month. Sample was collected in transport swab under the aseptic condition and send to the microbiology laboratory. Sample was included in this study from soft tissue infection of foot. Result:- Total 54 aerobic organisms were isolated from culture positive specimens. Among these organisms, 43 were gram negative while 20 were gram positive. Pseudomonas aeruginosa (30%) was found to be the main organism. Conclusion: - This study concludes that clinicians the appropriate antibiotic or combination of antibiotics for the treatment of Diabetic Foot Ulcer. 1. Centers for Disease Control and Prevention (CDC). Lower extremity amputation among persons with diabetes mellitus: Washington. Morb Mortal Wkly Rep. 1991;40:737-9. 3. Shaw JE, Sicree RA, Zimmet PZ. Global estimates of the prevalence of diabetes for 2010 and 2030. Diabetes Res Clin Pract 2010;87(1):4–14. 4. Chan JC, Malik V, Jia W, Kadowaki T, Yajnik CS, Yoon KH, et al. Diabetes in Asia: Epidemiology, risk factors, and pathophysiology. JAMA 2009;301:2129-40. 5. Mohammad Z, Abida M, Jamal A. 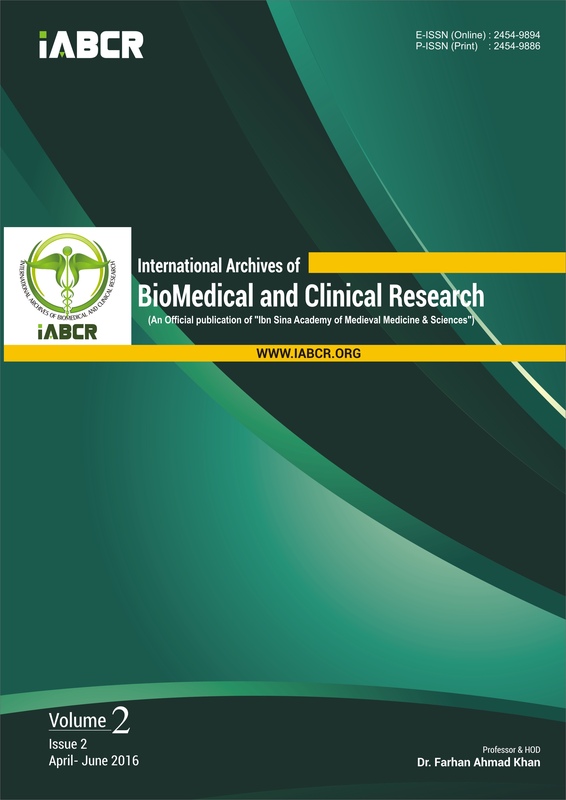 The clinico-bacteriology and the risk factors for diabetic foot infections with multidrug resistant microorganisms in north India. Biology and Medicine 2010; 2(4):22-34. 6. Peleg AY, Weerarathna T, McCarthy JS, Davis TM. Common infections in diabetes: Pathogenesis, management and relationship to glycaemic control. Diabetes Metab Res Rev 2007;23:3-13. 7. Lipsky BA, Tabak YP, Johannes RS, Vo L, Hyde L, Weigelt JA. Skin and soft tissue infections in hospitalized patients with diabetes: Culture isolates and risk factors associated with mortality, length of stay and cost. Diabetologia 2010;53:914-23. 8. Fincke BG, Miller DR, Christiansen CL, Turpin RS. Variation in antibiotic treatment for diabetic patients with serious foot infections: A retrospective observational study. BMC Health Serv Res 2010;10:193. 9. Singh N, Armstrong DG, Lipsky BA. Preventing foot ulcers in patients with diabetes. JAMA 2005;293:217-28. 10. Rao N, Lipsky BA. Optimising antimicrobial therapy in diabetic foot infections. Drugs 2007;67:195-214. 11. Shankar EM, Mohan V, Premalatha G, Srinivasan RS, Usha AR. Bacterial aetiology of diabetic foot infections in south India. Eur J Intern Med 2005;16:567-70. 12. Pathare NA, Bal A, Talalkar GV, Antani DU. Diabetic foot infections: A study of microorganisms associated with the different Wagner Grades. Indian J Pathol Microbiol 1998;41:437-41. 13. Viswanathan V, Jasmine JJ, Snehalatha C, Ramachandran A. Prevalence of pathogens in diabetic foot infection in South India type 2 diabetic patients. J Assoc Physicians India 2002;50:1013-6. 14. Chincholikar DA, Pal RB. Study of fungal and bacteriological infections of the diabetic foot. Indian J Pathol Microbiol 2002;45:15-22. 15. Nitzan O, Low M, Lavi I, Hammerman A, Klang S, Raz R Variability in outpatient antimicrobial consumption in Israel. Infection2010; 38(1): 12-18.